David Bouchard: ...the end of May and me done! ...the end of May and me done! The world moves too quickly. I realize this when I look at my BLOG and FB pages only to realize that I haven't had a chance to reflect or to share the magic in my life. Today, I'm off for the last week of my busiest and best year since I began touring in 2000. This past year has been the most successful of my thirteen years on the road. Everything seems to be coming together and for that I say miigwetch/marcee Kokum. loving parents with whom I can work to make the world a safer and better place for our kids. Pictured here are three students from the David Bouchard Public School in Oshawa. 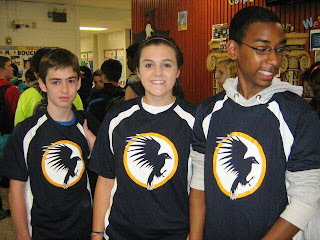 They are wearing the new tee-shirts with our Raven logo, (taken from one of my books). For me and Vicki...and for my entire family, this is an honour. It's also a responsibility and a challenge that will overshadow my next ten years. I am blessed and I am stoked!